BRIGHTON, Mich. June 14, 2012 – While we’ve already had a few 2013 Ford Escapes parked on our lot, things have really ramped up at the Louisville Assembly Plant where Ford executives celebrated the new crossover’s launch on Wednesday as it rolled down the line toward Brighton Ford! The 57 year old Louisville factory used to be the facility that brought us the Ford Explorer, but Ford recently converted the location into a automotive monster that can crank out as many as six different vehicles, including the highly-anticipated 2013 Ford Escape. "Today marks a celebration of progress and transformation," said Mark Fields, Ford's president of the Americas. "Louisville Assembly Plant's reinvention illustrates how Ford is going further, continuing to invest in American manufacturing and new jobs while delivering even more of the fuel-efficient vehicles that give customers true power of choice." Given the response and recent demand consumers have had for Ford vehicles this year, Ford has had to increase the amount of shifts at Louisville and other assembly plants. In fact, Louisville alone already added nearly 2,000 jobs for a second shift and plans to add a third, bringing in another 1,300 jobs. 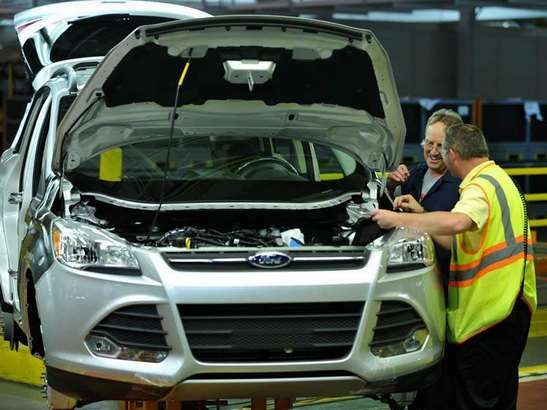 While these may not be jobs for us Michiganders, Ford has added more than 1,200 jobs to the Michigan Assembly Plant that makes the 2013 Ford Focus. But let’s get back to Louisville. We’re really intrigued by how a single Assembly Plant can put out 6 different vehicles. So how do they do it? Apparently, it’s all in the tools. That’s right, Ford’s new reprogrammable tooling not only allows the factory to create six models, but it lets them assemble six different models at the same time, making it Ford’s most flexible U.S. assembly plant to date. "Manufacturing flexibility is critical to staying competitive in today's global automotive marketplace," said Jim Tetreault, Ford vice president of North America Manufacturing. "Our ability to produce up to six vehicles from a single plant gives us a sizable advantage in quickly adjusting our products and volumes to match changes in customer preferences and market factors." Do you wan to learn more about the innovative 2013 Ford Escape? Feel free to Contact Us with any question you have! Even if it’s not about the Escape, we’d love to hear from you!